The Oscar Curse is real. Bradley Cooper goes from a mesmerizing performance as Chris Kyle to a bland, forgettable role as–what’s his character’s name again in this movie? Does it really matter? 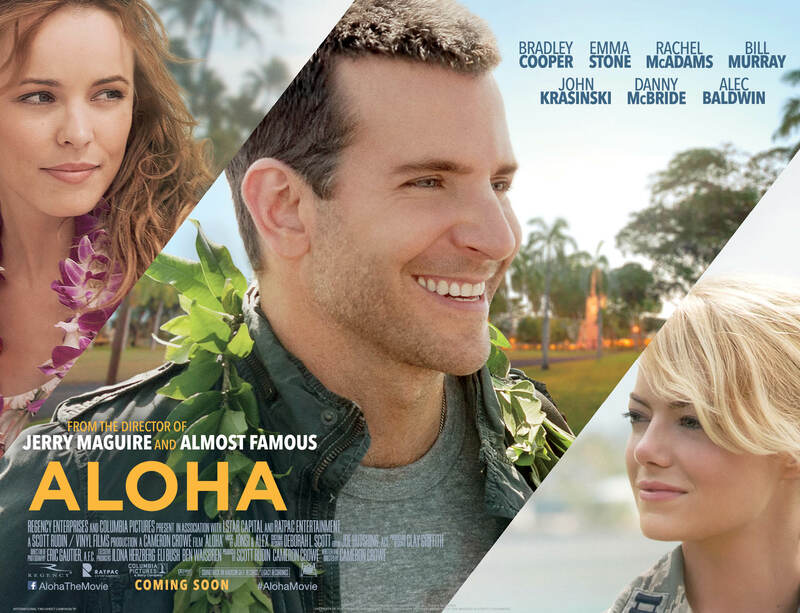 This is my review of Aloha! You all look great, but this movie is shiz. Dear Lord, in Your infinite wisdom, I ask You one question: WHY DOES THIS TERRIBLE MOVIE EXIST? Why are Bradley Cooper, Emma Stone and Rachel McAdams wasting the talent You gave them on this trainwreck? Right off the bat, I have nothing good to say about this movie. Nothing. I’m just going to list everything wrong with Aloha. The dialogue. Good Lord, the dialogue is horrendous. Tell me something: Do you go up to your best friend and say, “Hey there, such-n-such, my best friend of 27 years! We’ve been through so much together, like when we got lost in that forest. We sure took care of that dragon. Remember?” No! Nobody talks like that! I’m not kidding, the first fifteen minutes of this movie are just actors–not characters–actors telling us, the audience, who everyone is. Then when characters aren’t spewing exposition, they’re spouting off clever-sounding catchphrases that serve no purpose. By the second act, I was rolling my eyes any time someone spoke. Holy cow, the pacing of this movie is like spending two hours watching a turtle walk down a flight of stairs. I could probably name ten scenes that should have been cut from the final product. In fact, there is a botched edit that is so painfully obvious I’m starting to question who Director Cameron Crowe hired as his film editor. Here’s the scene: Bradley Cooper and Emma Stone are at some dance party and they part ways to go do…something, I don’t care to remember. Anyway, the camera cuts to the people dancing and then it hastily transitions to a woman who asks Bill Murray, “What is life?” Bill Murray has some monologue, but the “transition” from the dancing people to the woman and Murray was so flimsy that I couldn’t even pay attention to whatever he was saying. I could list more examples of scenes with awkward transitions, but then that would make my brain hurt even more. I swear Bradley Cooper is a good actor. He broke my heart in American Sniper! But you wouldn’t know that if this was your first Bradley Cooper movie. His only job in this movie is to stare at things with a whimsical expression and walk around, talking about satellites and other techno babble. Rachel McAdams is always pleasant to watch, but she’s got even less to do except tell Cooper how his character screwed up in the past. Bill Murray, why are you here? Alec Baldwin has one good scene and that’s it. John Krasinki, did you lose a bet? Is that why you’re in this abomination? Emma Stone is the only real character in this movie, and like Furiosa in Mad Max: Fury Road, she should have been the main character. Everyone does what they can, but the material leaves them stranded on the island of bad storytelling. There is no rescue for this movie.